Magento (CE) 2.1.5 on PHP 7.0.16. For merchants looking for support for Magento (CE) 1.x series, please check Magento 1 document. 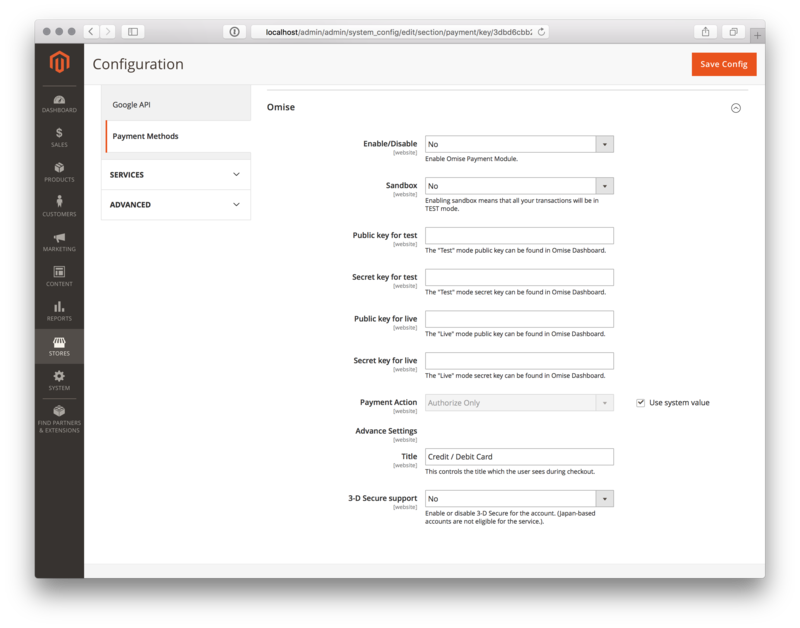 Log in to your Magento back-end with the administrator account. Go to Stores > Configuration > Sales > Payment Methods. Settings is displayed under the Omise section. The table below is the settings for the module and the description for each setting. Public key for test Your TEST public key can be found in your Dashboard. Secret key for test Your TEST secret key can be found in your Dashboard. Public key for live Your LIVE public key can be found in your Dashboard. Secret key for live Your LIVE secret key can be found in your Dashboard. Payment Action Set Authorize Only to only authorize a payment or Authorize and Capture to automatically capture after authroizing. To enable the module, select the setting for Enable/Disable to Yes. To enable sandbox mode, select the setting for Sandbox to Yes. If the setting for Sandbox is set to Yes, the keys for TEST will be used. If the setting for Sandbox is set to No, the keys for LIVE will be used.